The space rock, called asteroid 2012 TC4, is about 56 feet wide (17 meters) and will come within 59,000 miles (95,000 kilometers) of Earth at its closest point when it zips harmlessly by on Friday. That's about one-fourth the distance to the moon. But you don't have to wait to see live views of the interloping space rock: There are two live webcasts of the asteroid today (Oct. 11). The Virtual Telescope Project and Slooh Space Camera, two groups that offer live telescope views of space via the Internet, will be providing the asteroid imagery. On Oct. 12, 2012, at 05:17 UT, the asteroid 2012 TC4 will reach a minimum distance from the Earth of less than 100.000 km, about 0.2 times the distance of the Moon. Image released Oct. 8, 2012. The Virtual Telescope Project in Italy run by astrophysicist Gianluca Masi will provide a live telescope view of asteroid 2014 TC4 starting at 3:30 p.m. EDT (1730 GMT) via the project's WebTV. You can access the webcast here: http://www.astrowebtv.org. Masi has already recorded several videos of asteroid 2012 TC4, and will provide live commentary during the webcast. He said the public is often attracted to asteroid flybys because of their connection with asteroid impacts on Earth. But there is scientific value behind them as well. "Asteroids are very intriguing bodies, strongly connected with the origin of our solar system," Masi told SPACE.com in an email. "When an asteroid approaches our planet, we have good chances to study them better, especially small ones." The Slooh Space Camera views of asteroid 2012 TC4 will be webcast later today at 5:30 p.m. EDT (2130 GMT) and will be available here: http://www.slooh.com. "One of our missions at Slooh is to provide the public with free, live coverage of amazing celestial events," said Slooh President Patrick Paolucci in a statement. "We will be tracking asteroid 2012 TC4 live from our observatory located on the Canary Islands - off the coast of West Africa." Paolucci will provide commentary during the webcast and will be joined with Slooh's outreach coordinator Paul Cox and astronomer Bob Berman, a columnist for Astronomy Magazine. The webcast can be watched via computer or mobile device, Slooh officials said. It may even be possible for seasoned amateur astronomers to see asteroid 2012 TC4 using a small telescope. According to the website Spaceweather.com, which monitors night sky events, the asteroid "will be close enough to photograph through backyard telescopes as it brightens to approximately 14th magnitude." Magnitude is a scale used by astronomers to measure the brightness of objects in the night sky. The lower the magnitude number, the brighter the object. This plot shows the orbit of Near-Earth Asteroid 2012 TC4. Image released Oct. 8, 2012. 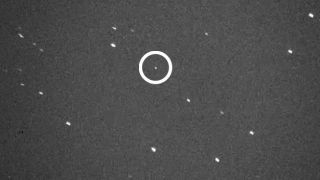 NASA has reportedly been observing the asteroid 2012 TC4 with radar to better determine its orbit since its discovery on Oct. 4. Asteroid 2012 TC4 is one of two asteroids to pass Earth inside the moon's orbit this week. On Sunday (Oct. 7), an even larger space rock — the 100-foot-wide (32-meter) asteroid 2012 TV —passed Earth at a range of 158,000 miles (255,000 km), or about 0.7 times the distance from Earth to the moon. The moon is on average about 238,000 miles (383,000 km) from Earth. NASA and astronomers regularly monitor the skies for near-Earth asteroids because of the potential threat a large asteroid strike could pose to our planet. NASA's Asteroid Watch program is based at the agency's Jet Propulsion Laboratory in Pasadena, Calif.
"We get passes between Earth-moon fairly frequently actually, although usually smaller space rocks," Asteroid Watch scientists wrote this week on Twitter while discussing asteroid 2012 TV. If you snap a photo of asteroid 2012 TC4 crossing the night sky on Friday, Oct. 12, and would like to share it with SPACE.com, send images, comments and location info to managing editor Tariq Malik at: tmalik@space.com.